These simple Christmas cards are made quickly and easily with the help of stickers or buttons and a swift dab of glue! Vary your materials according to the age of the children. 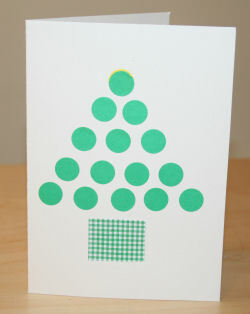 For younger children, draw a simple Christmas tree shape lightly on the front of your card with a pencil. 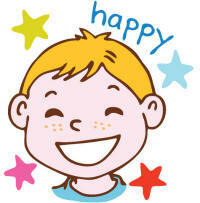 Now fill in the shape with a selection of stickers or buttons, and add embellishments as desired. The buttons were attached with a dab of PVA glue. Notice that each row of the tree has an increasing number of buttons, and that the size of the buttons vary. This card looks great with an odd assortment of buttons, too - and if you have access to an old button collection you will be able to make some lovely cards. Not the cheapest card we made! 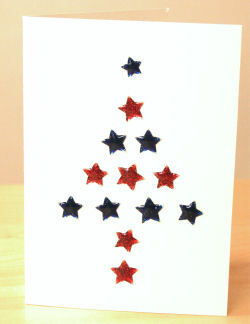 This card is gorgeous and so quick to make using star gel stickers in two colours. 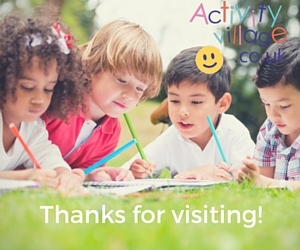 Fun for younger kids, placing the stickers is great motor skills practise! For little ones you might consider marking the position of the stickers beforehand. We used a scrap of gingham paper, applied with a glue stick, for the base. Highlight with glitter or sequins if you wish. A small dab of glue on each sticker and a sprinkle of glitter looks fabulous. We had fun (and got very sticky) applying all sorts of glittery substances to these cards. You could use any of the template designs on our Christmas templates page, but the tree, star and stocking work particularly well. These cut out Christmas cards are simple to make but they look extra special and are sure to be appreciated!